The Californian Massage training will allow you to learn beautiful manual techniques to give a complete basic massage session to your clients or to your beloveds. You will have the opportunity to get in contact with new interesting people in an international atmosphere; this can be a beautiful input for your future, in a time when many people are starting new professional experiences and a brand new life. In this context, practising the Californian Massage is very appropriate to activate great changes and transformation processes. Discover more about the benefits and about how this technique works. Or watch the video. And all this is going to take place in Canary Islands: latley one of the favourite destinations, since it combines a pleasant life style with new opportunities to start over professionally. Let’s not forget that these are volcanic islands, in the deep waters and floods of life of the Atlantic Ocean, the islands that offer the best climate in the world between the Aliseis and the Tide of the Gulf. This training is going to happen in a high energy vibration and you will not miss receiving knowledge and pleasure, in touch with people and with nature. 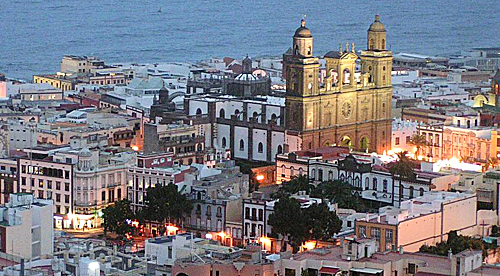 Las Palmas de Gran Canaria is a city on the ocean, facing Africa and receiving the influence of the Sahara desert. The streets of the historic center are beautiful, thanks to ancient buildings in colonial style. The city has different beaches among which the main one, Playa de las Canteras, extends for about three kilometers and offers as much comfort as the most famous shores of the islands, being just a few minutes far from the historic center. Atlantida, Art, Meditation and Natural Physical Therapy Studio, is placed just in the heart of the city center, near Saint Anna Cathedral with its picturesque district Vegueta and very close to the Shopping district of Triana. The Studio is also at walking distance from the characteristic Pueblo Canario surrounded by Doramas Park, an enchanting tropical garden. All these places represent the scenario in which the training programme will take place. Atlantida Studio is a project of an Italian couple of Artists who found Gran Canaria as the ideal place where they wished to move and make their dream come true. The Studio is inside an ancient palace of the early 1900’s. The training will be set in the living room of the ancient house. The training will start on Friday September 23rd until Tuesday September 27th 2016 included. At the end of this Training, the student will be able to give a complete professional session of Californian Massage. The Training is organised in a dynamic natural structure, giving space to the recognition of subtle energetic aspects concerning the students both individually and in group. This allows the evolution of personal merits aimed at recognizing the most effective way to perform the Californian Massage technique. For this reason, this is not just a professional training, but also a path of personal growth helping to develop the ability of recognizing and evaluate individual characteristics and talents. Recognizing your own talent, develop your potential and express it, makes it possible that you see them also within others and encourage them to express i their own turn, if they wish. You will be given ducational material. This training gives you the opportunity to become International Practitioner of Holistic Medicine, a valuable recognition of quality all over the world. The participants who will positively complete the training, will receive the certificate of qualification and become members of the international association IPHM (International Practitioners of Holistic Medicine). It is mainly a practical training: from movement techniques to the preparation to connect with the correct quality of the space to approach the work with another person. The structure of the training is based on building your own perception of physical-energetic communication with another person, for this reason the students make experience also in receiving contact, not just giving. This is fundamental to develop recognition of the quality of contact and learn how to give it to the other person. The training programme includes several meditation techniques. There will be also sharing sessions in order to integrate in the cognitive space what has been learnt through the experience phases. Here, the participants are not just listening, but actively take part; thanks to this, the integration process happens on the complete level of the body-mind system. In the last years, the Californian Massage has become more and more required and appreciates in Wellness Centers and Spas. At present, it is offered in Spas, Wellness Centers, Resorts, Touristic Structures, Cruises, National and International Hotels. Professionals specialised in this therapeutic holistic technique are more and more required. To take part into this training, you are required to be sensitive in relating with others and to be able to keep a respectful attitude when touching the others. Anyone who is aware to own this requisite are welcome to access this training. The price is 550€, including buffet lunch and educational material. When you book your training, we will help you get in touch with B&Bs close to Atlantida and you will choose your favourite accomodation for a price between €18 and €58 per night including breakfast. We recommend to book in advance to make sure you can easily find the best accomodation. The airport transfer is very easy, quick and cheap by bus. The bus stop is in San Telmo area, at walking distance from B&Bs and Atlantida (ticket around 4 euros can be bought from the bus driver). One of us will be welcoming the participants at their arrival at the airport.